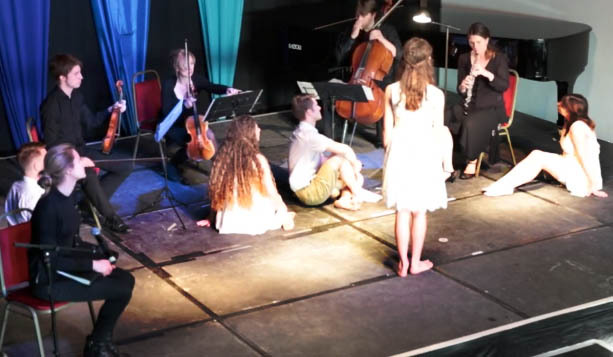 Interdisciplinary collaborations are central to London Conchord Ensemble’s programming, whether with art, literature, theatre or dance – a cohesive and integrated collaborative programme offers audiences an experience that is so much greater than the sum of its parts. Rhythm of Silence, co-commissioned by The Charleston Trust and Rathfinny Wine Estate, was given its world premiere performance at Charleston Festival in 2015. This is an incredibly exciting new performance piece that blurs the boundaries between literature and music; inspired by Virginia Woolf and Benjamin Britten and written and devised by Alexandra Spencer-Jones, the work draws on Woolf’s assertion that The Waves was written ‘to a rhythm, and not to a plot’. Virginia Woolf pushed against the conventional boundaries of writing; she experimented and imagined new artistic form. In Rhythm of Silence, players of London Conchord Ensemble are joined by actors from Action to The Word to bring Woolf’s vision (of new artistic form) to life in a daring and thought-provoking performance piece. Rhythm of Silence is a musical and physical exploration of the power of silence and solitude vs the claustrophobia of repetitive work and “polite” society and inhabits the world between music and language. Incorporating themes from ‘The Waves’, writings from Virginia and Leonard Woolfs’ diaries, readings by Juliet Stevenson and a complete performance of Benjamin Britten’s haunting Phantasy Quartet (written within a year of ‘The Waves’). Led by Artistic Director Alexandra Spencer-Jones, Action To The Word deliver dynamic, exciting and shocking theatre from new musicals to electrifying adaptations of classics.